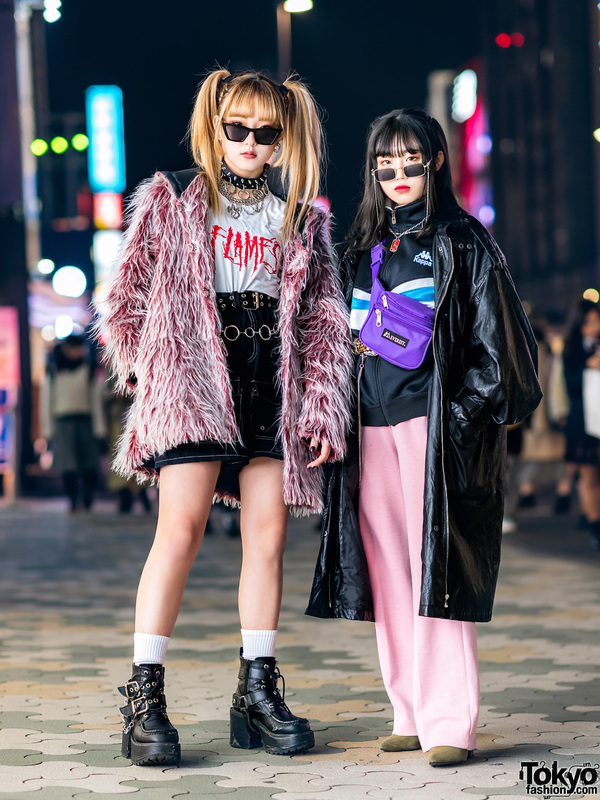 In Harajuku, we came across Megumi and Lisa, two students who we often feature on our street snaps. 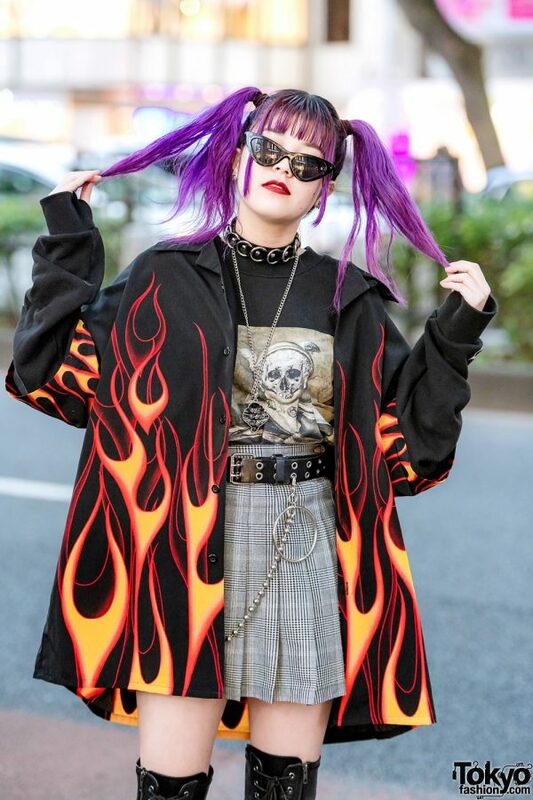 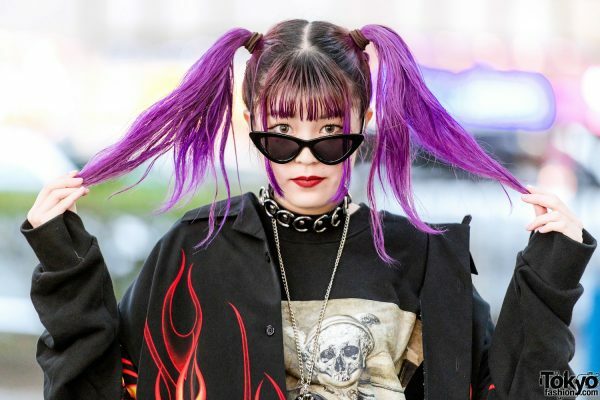 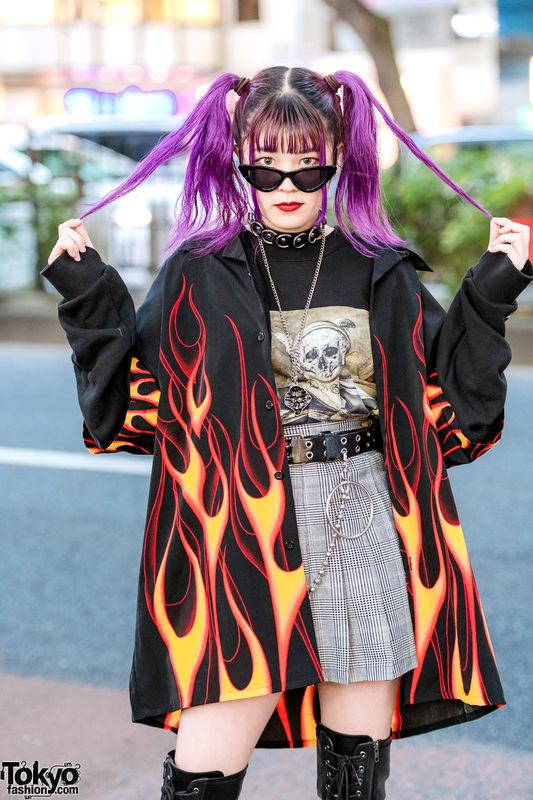 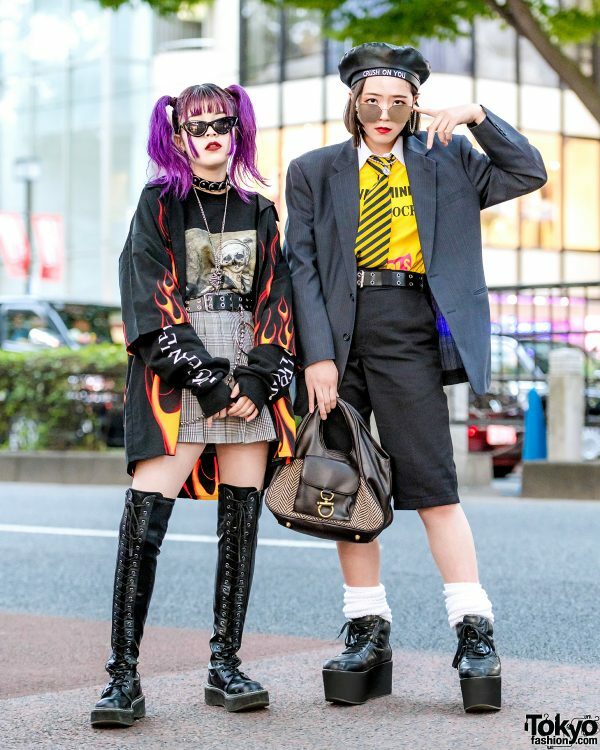 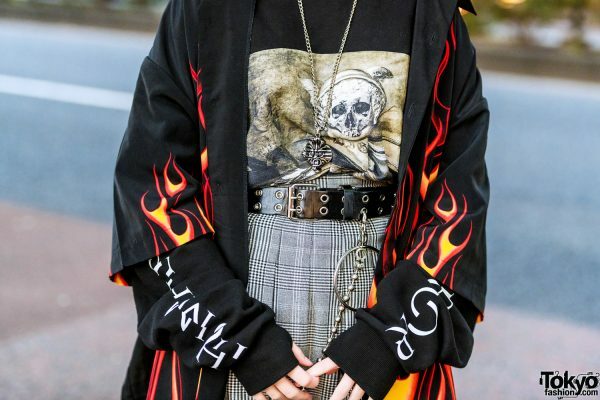 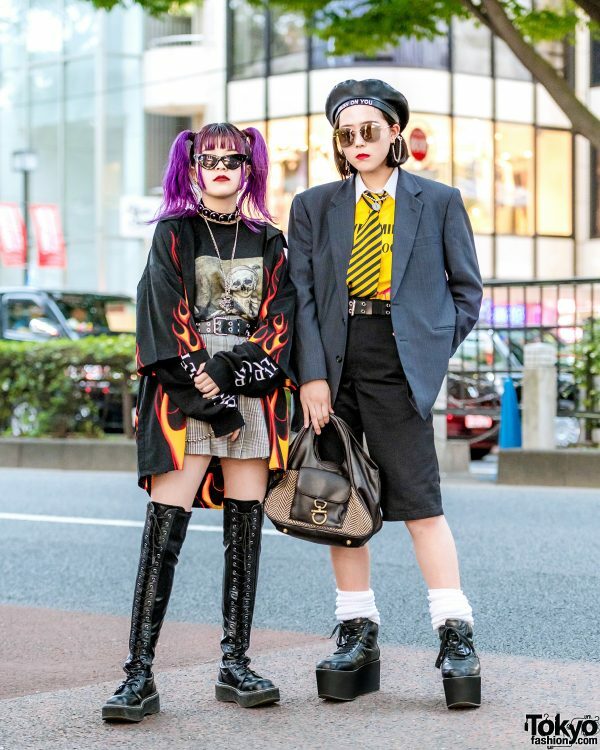 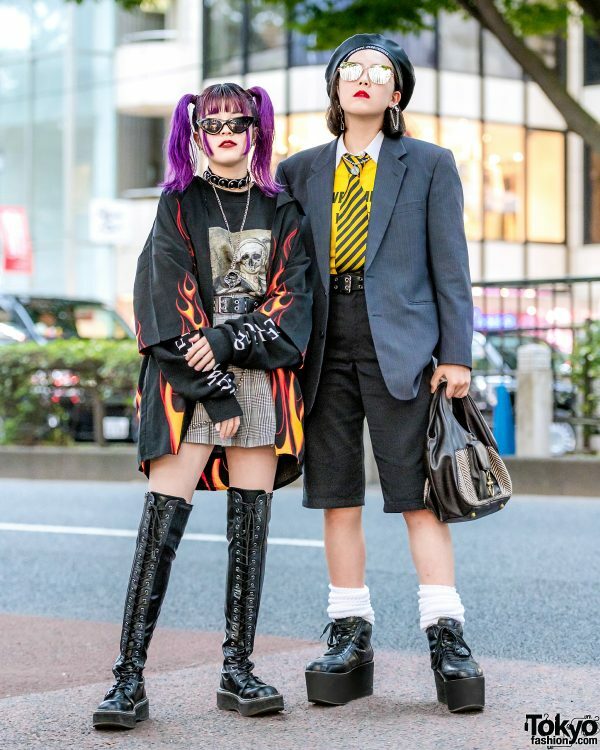 Sporting twin purple tails at the the left is Megumi, who is clad in a black skull print sweatshirt from Never Mind the XU, which she tucked into a short pleated plaid skirt, and topped off with a black flame print button down shirt. She finished off her ensemble with thigh-high lace-up boots from Demonia, a black sling bag, and accessories – mostly from Never Mind the XU – such as black sunglasses, a black o-ring choker layered with a silver pendant necklace, a black double grommet leather belt, and a silver ball chain with an oversized silver o-ring. 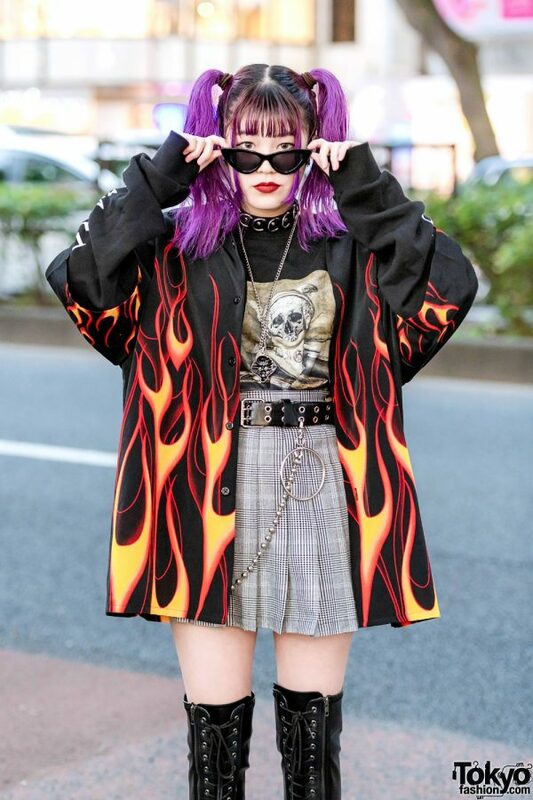 Megumi lists Never Mind the XU, Faith Tokyo, and Open The Door as her fashion favorites, and she likes the music of Pentagon and Twice. Follow Megumi on Twitter and Instagram. 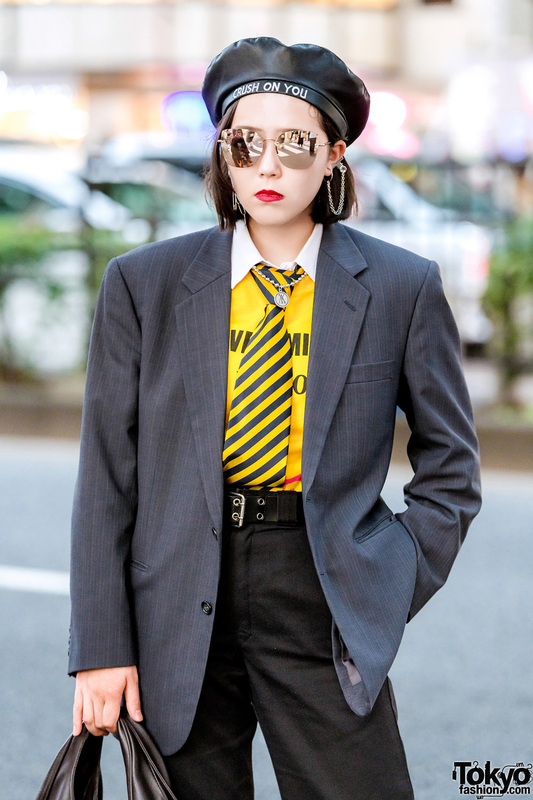 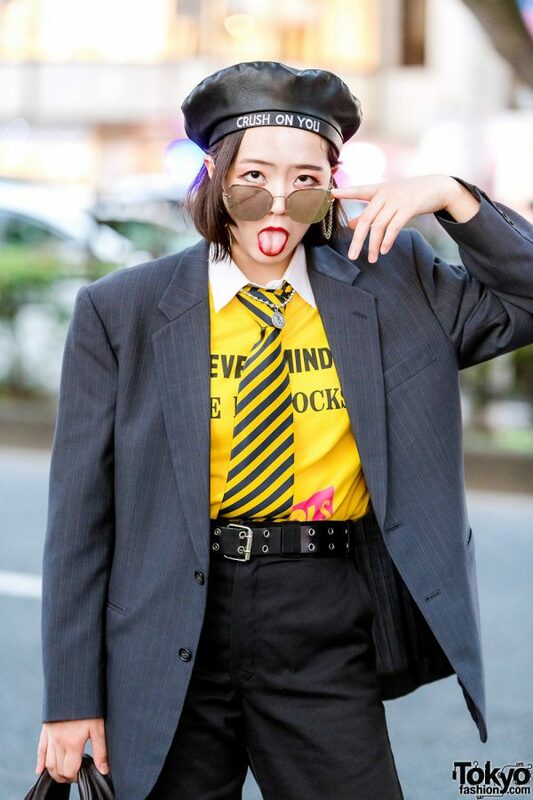 Meanwhile, Lisa stepped out on the street wearing a vintage outfit which consists of a grey pinstripe blazer, a yellow t-shirt over a white collared shirt, a black-and-yellow striped necktie, and black tailored knee-length shorts. 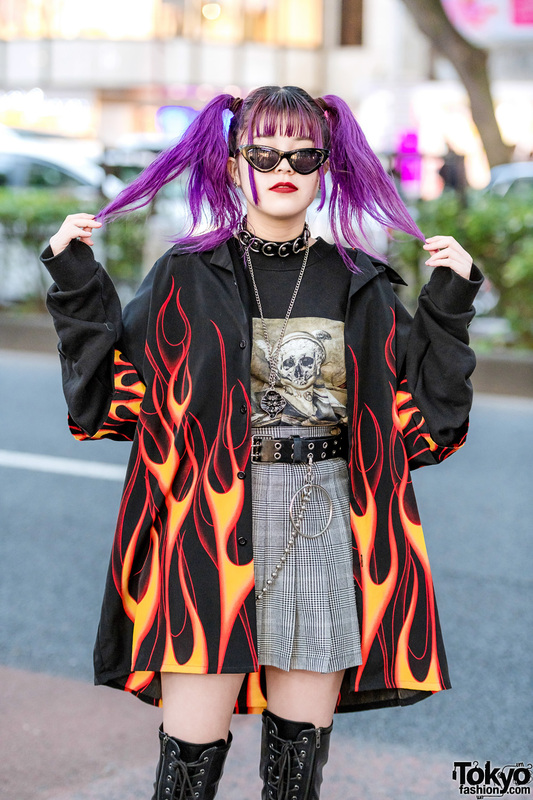 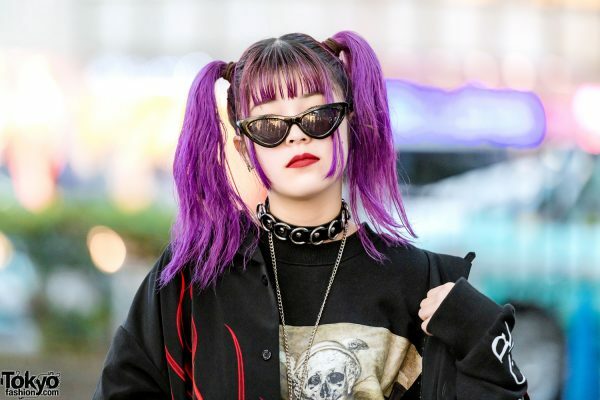 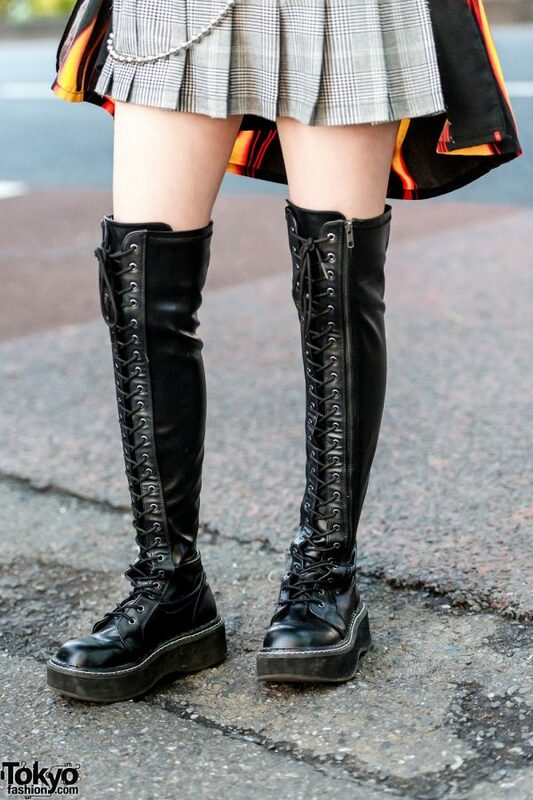 The 17-year-old student completed her outfit with white ribbed socks, black platform sneakers from Punyus, and accessories – from Another Youth – such as a black leather Crush On You beret, oversized mirror sunglasses, mismatched silver earrings, a ball chain pendant necklace, and a black leather belt. 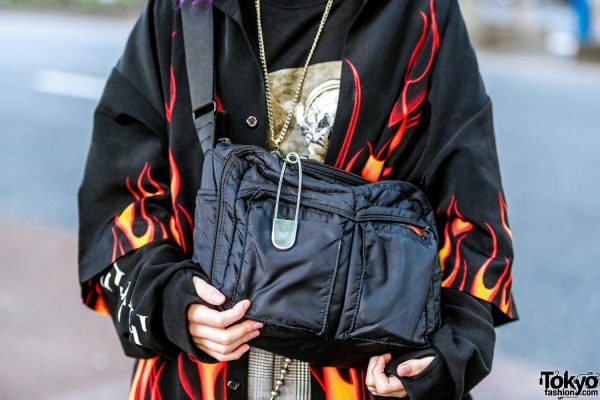 In addition, Lisa is carrying a black vintage leather handbag with a chevron print side. Lisa’s favorite fashion brands are ESC Studio and MTD, and she loves listening to hip hop music. 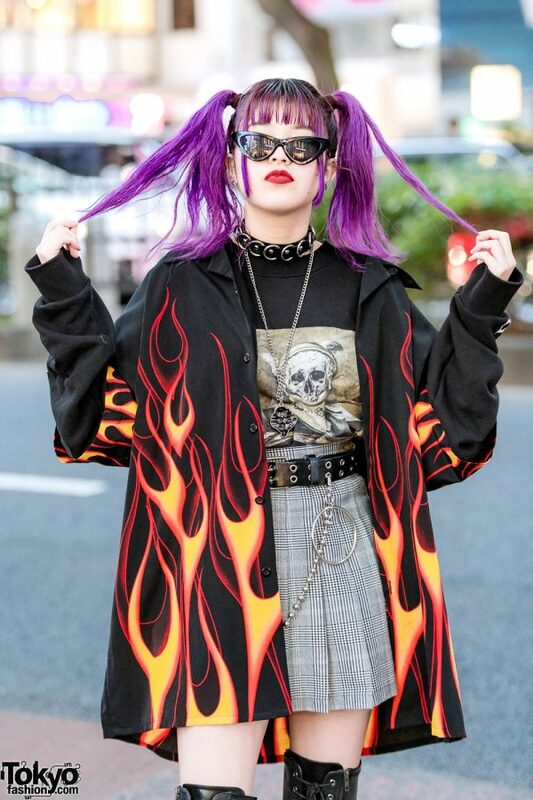 Lisa is also active on Instagram and Twitter.